Air pollution is harming people with weak hearts - even killing them, a big international study reveals. Experts estimate the toll includes thousands of Britons each year. 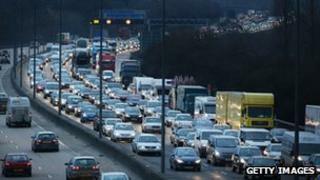 The British Heart Foundation, which funded The Lancet work, says the UK must clean up its air - many of its cities often exceed safe levels set by the European Union. The government has already admitted that in 15 regions, air quality will breach EU limits until 2020. But Defra says it is committed to improving air quality and that most parts of the UK meet EU air quality limits for all pollutants. Air pollution, largely from traffic fumes, has previously been linked to heart attacks but not heart failure. This happens when the heart muscle becomes weak and less good at its job of pumping blood around the body. It is often the consequence of a heart attack and affects more than 750,000 people in the UK. The Lancet research looked at 35 studies with data for thousands of patients in 12 countries, including the UK, the US and China. The strongest link was found with gases such as carbon monoxide and nitrogen dioxide, as well as fine particulate air pollution - fumes from buses, taxis and lorries that can get deep into the lungs and, from there, into the bloodstream. People with already weakened hearts who were exposed to high levels, by living near to or travelling along busy roads, for example, were particularly susceptible. And the increased risk seems to be strongest on the day of exposure. Dr Anoop Shah and colleagues who carried out the work say moderate reductions in air pollution could avoid 8,000 US hospital admissions for heart failure each year. "There's no reason why the impact wouldn't be similar in the UK." Alan Andrews of the lobby group Client Earth said: "The UK has a big problem with air pollution, particularly from road traffic, and the government response sadly has been worse than useless." He said people should be alerted when pollution levels are high so that they can take measures to protect themselves, by staying indoors when possible and avoiding busy roads. According to the World Health Organization, air pollution in towns and cities kills 1.3 million people globally each year. UK estimates suggest nearly 30,000 people die prematurely each year as a direct result of exposure to air pollution. Air pollution has been linked to asthma and other lung diseases, including cancer, as well as heart problems. The Chief Medical Officer recently highlighted the impact of air pollution in her first annual report on the state of the nation's health - air pollution was highlighted among the top 10 causes of mortality in the UK.